Carn Urnan cairn (sometimes called Carn Irenan or Carnurenan) is a Clava type chambered cairn situated on the high ground on Mulbuie between Tore and Maryburgh. 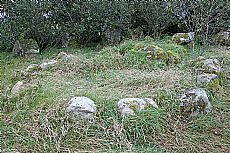 Like cairns of similar type, Carn Urnan has a distinctive chamber, passage and cairn lined with large kerbstones as well as a surrounding stone circle, with the stones grading in height, the highest stone in the south-west. The south-westerly orientation of the passage is also typical of the Clava cairns. At Carn Urnan only the larger stones remain in situ with the rest of the cairn material likely to have been robbed in antiquity or more modern times for use as building materials for houses or stone walling. The edge of the chamber, cairn and passage are defined by larger stones and easily identifiable on the ground. The exterior stone circle is obvious in parts with four stones remaining upright and the rest lying on their sides. Thick vegetation in places obscure parts of the site and make it difficult to identify whether any cupmarks or other decorative features, as found on other Clava cairns occur here. This type of site has been most comprehensively investigated at the Balnuaran of Clava site complex which has been the namesake for these cairns. The excavation and survey work undertaken between 1994-6 by Richard Bradley investigated the construction and careful choice of building materials, changing common interpretations of these cairns. Chambered cairns of this type were originally thought to be a later Neolithic date (c.4000-2200 BC), contemporary with the more numerous Orkney-Cromarty type cairns such as nearby Kilcoy and Carn Glas. However, Richard Bradley's work has shown that they date to the early Bronze Age (c. 2000 BC). 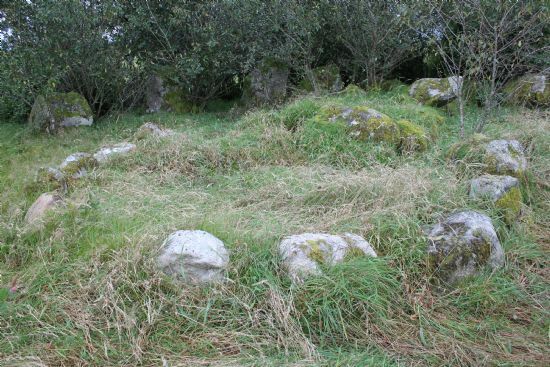 Typically these passage graves or chambered cairns would have been used for the burial of several individuals during the time they were in use, though far fewer than the Orkney-Cromarty communal burials of the Neolithic. Human remains have been found as inhumations or cremation deposits. There have seldom been any artefacts or material culture found with these remains, although this may be due to poor preservation in acidic soils or subsequent disturbence. These sites as well as being a place for burial of important individual may have been an important component in ceremonies and gatherings of the community. They would have required a lot of effort to build and this implies they played an integral role in the belief system or ideology of the early Bronze Age people. The Clava site type is found concentrated around the area of Inverness, with a relatively confined distribution from the Spey to Glen Urqhuart, Black Isle to Aviemore. They are commonly found along river valleys and on good agricultural land. They are often found in clusters, with Balnuaran of Clava one of the most complex assemblages of passage graves and ring cairns in the area. Carn Urnan is one of the more northerly examples. Most Clava type cairns are situated on low-lying areas, but Carn Urnan is different. Its situation on the high ground gives it excellent views over the surrounding landscape and would likely have been a prominent site in the landscape. A.S. Hensall and J.N.G. Ritchie 2001. The Chambered Cairns of the Central Highlands. Richard Bradley 2000. The Good Stones. A New investigation of the Clava Cairns.